I'm not impressed by anyone's stance on Donald Trump. I'm completely opposed to the office of "president" existing, just as I am opposed to every other political office. I don't want anyone holding those offices and using them to molest anyone or their liberty. I don't think decent people hold political office. If a decent person finds himself in a political office, they won't stay decent for long. And I'm talking nanoseconds or less. I also believe that holding a government "job", even of the most benign variety, causes ethical (and perhaps, moral) damage to the employee in that "job". I would never wish that on anyone I like. For these reasons, I get indigestion hearing people going on and on about Trump, either for or against. He simply doesn't matter to me one way or the other. No "president" would. 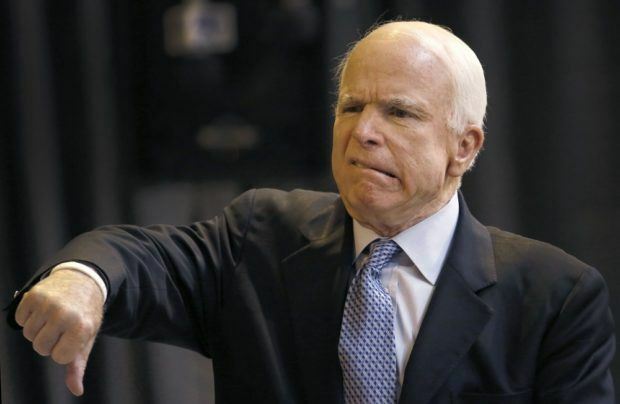 The ONLY reason the dead dirtbag anti-liberty bigot John McCain is being treated like he was some kind of hero is because he was vocally anti-Trump. That's it. If he hadn't come out of that particular closet none of the national mass media proglodytes would have spent the past couple of days praising his corpse's "legacy". In fact, they would probably have taken the position that his being dead is a good thing. But because he was anti-Trump while being "Republican" he is praised. No, his status as a former troop isn't the reason, nor is the fact that he was a POW. Those are used as justifications, of course, but they aren't the real reason. His greatest value was in being anti-Trump. Well, la-dee-dah. Anyone can do that.